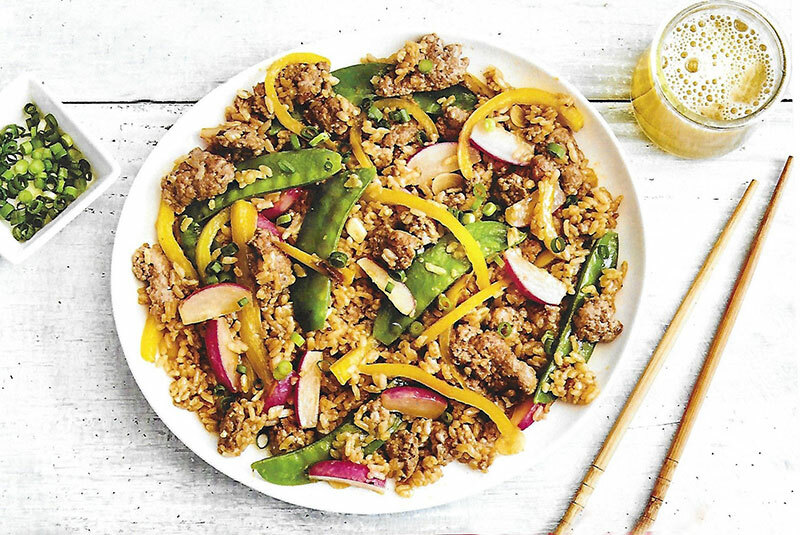 In a medium pot, add the rinsed sticky rice and 1cup of water with ½ tsp salt. Bring to a boil over high heat. Once boiling, cover and reduce the heat to low. Cook for 10-12 min, until all the water, has been absorbed. Set aside, still covered, until needed. Alternately you can use a rice cooker ratio 1:1 which will when done also keep it warm until you need it. In a large pan (non-stick preferably) heat 2 tsp oil over medium until hot. Add the radishes, snow peas and garlic, cook for 3 min, stirring frequently, until fragrant and softened. Remove the vegetables from the pan. Dry the ground turkey with a paper towel. Add 1 tsp of oil to the pan and heat at medium-high until hot. Swirl to coat the pan. Add the turkey and season with salt and pepper cook for 1-2 min. breaking up the meat with a spoon. In a small bowl mix the Ssamjang sauce & hoisin sauce. Add the mixture and vegetables. Stir until well coated. The Asian Market I went to buy the ssamjang sauce and sticky rice. 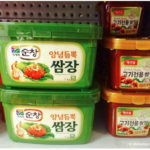 As it was all in Asian it was a good thing I went in with this picture of ssamjang sauce and I was quickly shown where it was in the aisle. Also when I asked where the sticky rice was located I was shown but it was called sweet rice. How to rinse the rice: In a medium pot, add the sticky rice and enough warm water to cover. Using you had swirl and rinse the rice. Pour off the cloudy water and refill with cold water. Repeat until the water is clear, about 3 or 4 times. Radishes: when eaten raw, are spicy, crisp, and zesty. Varieties can range from very spicy (similar to the heat of raw garlic) to very mild. Cooking brings out the sweetness and milds the spice considerably. Ssamjang: means "sauce for wraps" in Korean, it has a wonderful combination of sweet, spicy and salty elements. It’s like American barbecue sauce, as it’s often used with grilled Korean specialties like bulgogi (marinated shaved beef), galbi (thinly sliced short ribs) and pork belly.